US Democrat congressman John Conyers, well known for being one of the Polisario’s staunch supporters in the United States, was forced to resign last Tuesday, under pressure from his party, after he was accused of sexual harassment by his former assistants. John Conyers, 88, Dean of the House of Representatives, who has been lobbying for the Polisario separatist thesis for years, is now making the headlines of American and international newspapers. After the outbreak of this scandal, Conyers had no choice but to resign from the Lower House of the Congress, where he had been representing a Detroit constituency since 1965. He had also held the position of Democratic Minority Leader in the judiciary Committee. However, instead of talking about a resignation, Conyers used the euphemism of retiring. “I’m retiring today,” he told a Detroit local radio station from the hospital where he was admitted last week. Later, his colleague Sheila Jackson Lee read his resignation letter in the House of Representatives. According to Conyers’s victims, they have been sexually harassed for years. 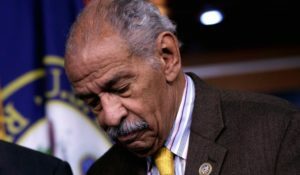 John Conyers reportedly paid $27,000 in 2015 to buy the silence of one of his former assistants, who accused him of having dismissed her abusively because she rejected his sexual advances. An internal investigation has been launched by the Congress to shed light on the scandalous practices of the senior US Congressman. The man, who rubbed shoulders with renowned figures, including Martin Luther King Jr. and Rosa Parks and who claimed to be a champion of the struggle for the civil rights of blacks, ends his long political career in controversy.